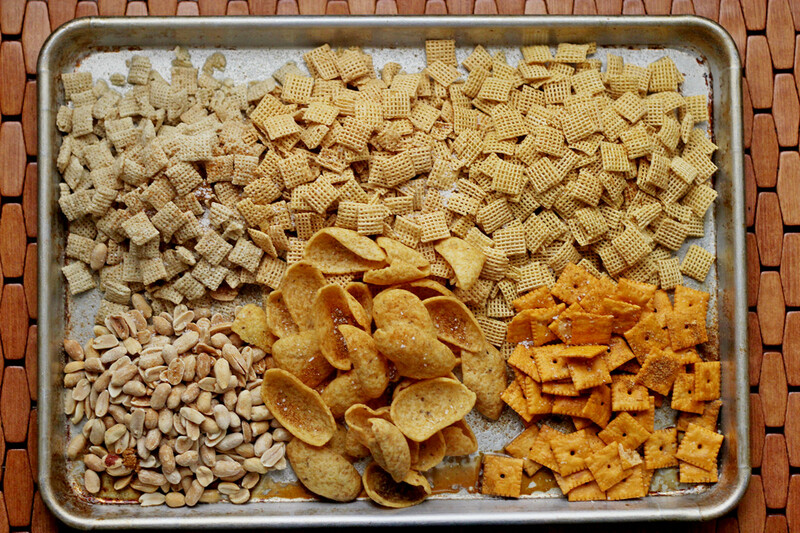 I have no idea why I don't make Chex Mix all the time. It's soooo tasty, and compared to downing a hunk of pie or cake, it's a reasonable snack food. 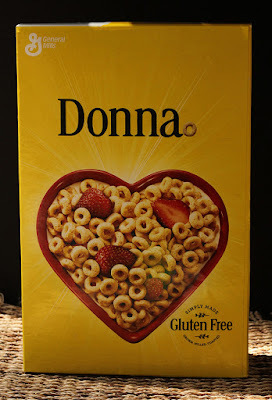 And now that there are gluten-free versions of the cereals, it would be easy to make it a gluten-free snack. Well, it's not gluten free if you throw crackers in there like I did. But you know that, right? So anyway, this particular version of Chex Mix has a bit of a south-of-the-border theme. For several reasons. First, I've been on a Mexican food binge. Things like that happen. I wander into a cuisine and I get stuck there for a while. I've had chicken mole, fajitas, tacos, tamales, and enchilada recently. So my taste buds are leaning towards that flavor profile. 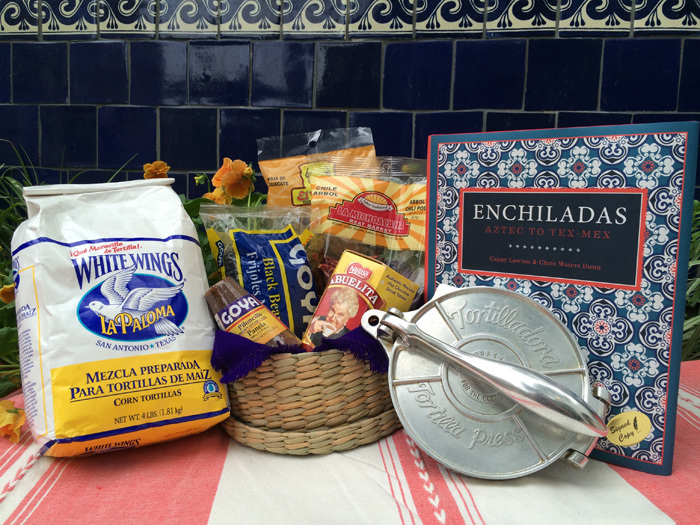 And second, my friends at General Mills sent me some margarita-themed holiday swag. So that reinforced my craving for Mexican flavors. Chile con Limon seasoning is often used for sprinkling on fresh fruit, but it's also great for seasoning other things. As the name implies, it's spicy and has lime flavor as well. Perfect for Chex mix. It's got a nice amount of spice, but it's not too crazy. If you want more heat, you can certainly add more. Why, yes, that is felt mistletoe! 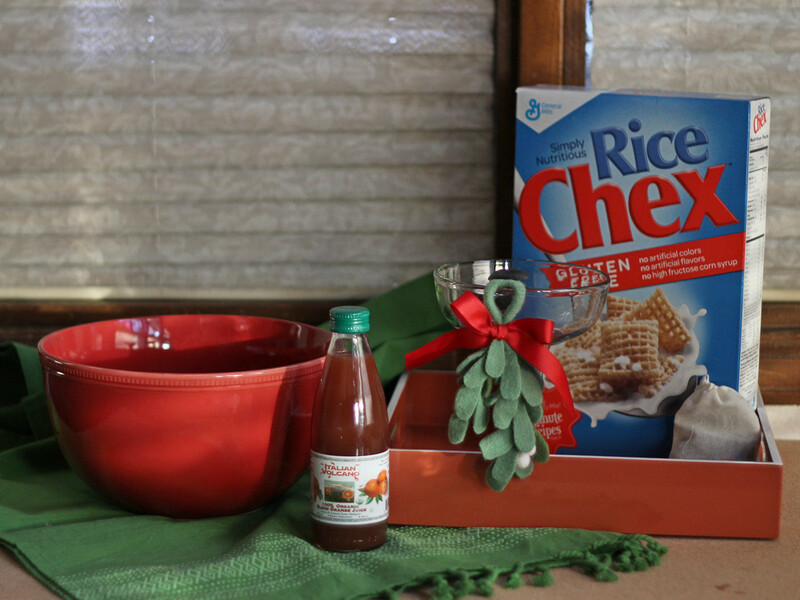 While Chex Mix might not be considered a holiday food, I know a few people who make large quantities right before Christmas and they hand it out as gifts. It's also nice to have around for snacking and noshing with guests, or to stave off hunger while you're busying doing all that holiday stuff. You know, the wassailing, and all that. And it's a nice snack to have around in bowls when you have people milling about during holiday visiting. Or, you know, just stash it away for yourself as a little holiday treat. 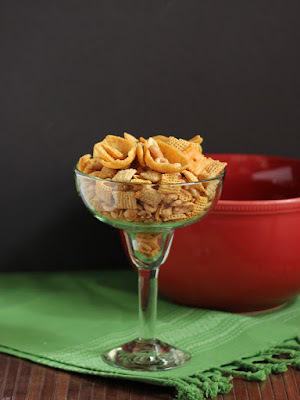 6 cups Chex cereal (I like using different flavors, but you could certainly use all of one type. Heat the oven to 350 degrees with the butter in the pan. By the time the oven is heated, the butter should be melted. Add the worcestershire sauce and stir it around. 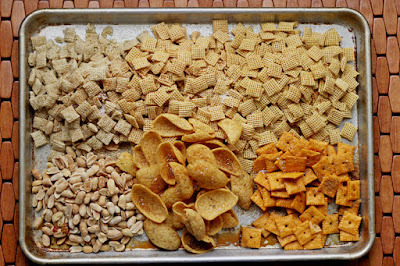 Add the cereals, nuts, crackers, and chips. Stir and toss it all around until everything has had a chance to meet the butter. You might notice that in the photo above, I hadn't added the O's. They got there. Just not for the photo. 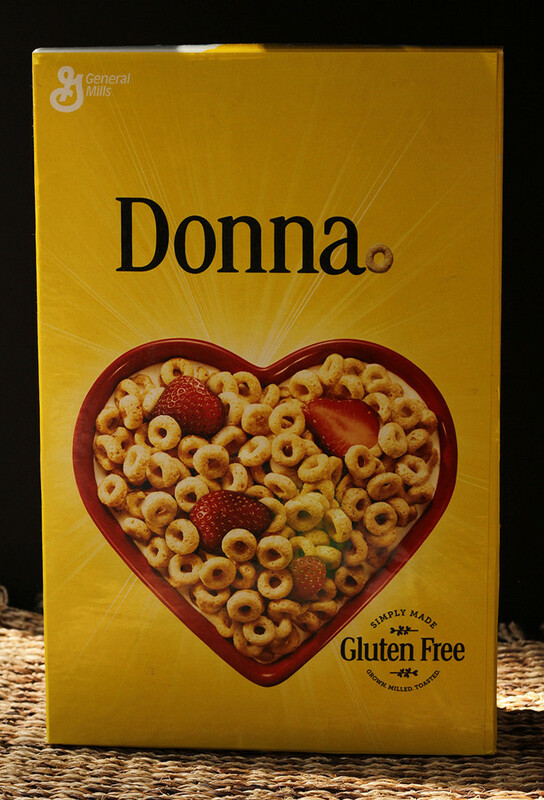 If you don't have Donna O's, you can use regular store-bought Cheerios. I crack me up. I really do. Sprinkle the Chile con Limon and salt over the top and give it all another stir. Put the pan in the oven and bake until the cereal is a little toasty and the butter is mostly gone, stirring a few times during the cooking, about an hour. Let the mix cool before storing. 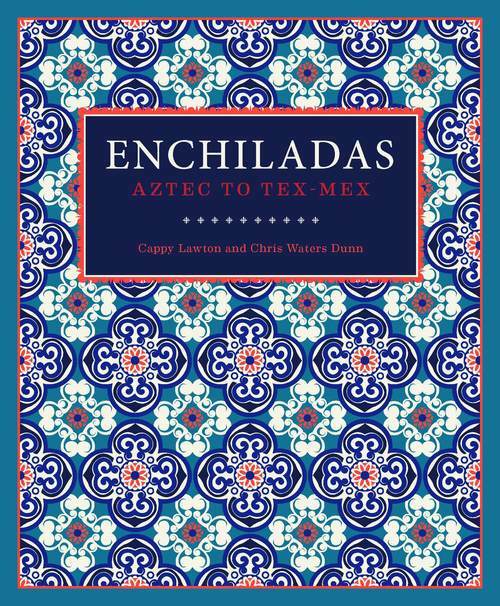 I love enchiladas, so the fact that there's an entire book about them makes me just a little giddy. I was invited to participate in a book tour for the book and I got the chance to make some amazing enchiladas. Enchiladas suizas were one of my favorites, dating way back to when Bob and I were dating. Suizas, I was told, meant that the enchiladas were Swiss-style, which refers to the dairy products used. These enchiladas have a creamy green sauce and are topped with cheese. The instructions are long, but that's because they're detailed. These are actually very easy to make, and you can make some of it ahead of time, like the sauce that can be made and refrigerated until you need it, and the chicken that can be cooked, shredded, and refrigerated until you're ready to assemble. I had more sauce than I thought I needed, but when I reheated, I added more sauce, because it's really good. I've also used some on tacos. Next time I make these, I might mix some sauce into the shredded chicken. It's a really good sauce. I can see using it for a LOT of things. 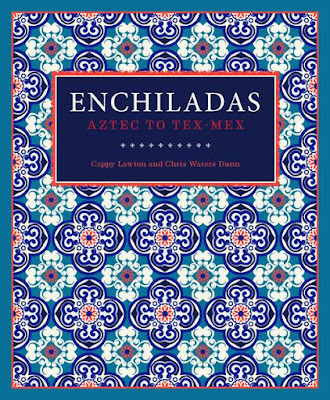 Reprinted from Enchiladas: Aztec to Tex-Mex Copyright © 2015 by Cappy Lawton and Chris Waters Dunn. published by Trinity University Press. Using a slotted spoon, transfer vegetables to a blender. Add cilantro and process for a few seconds more. In a saucepan over medium heat, place 1 tablespoon (15 ml) oil. but do not let it boil. Remove from heat and season with salt to taste. Cover, set aside, and keep warm. Pour oil to a depth of 1⁄2 inch (12 mm) in a heavy skillet over medium-high heat. Heat to low frying temperature, about 300°F (150°C). Place each tortilla in the oil and fry for a few seconds, just long enough to soften. the enchiladas in a single layer. Sprinkle queso asadero or queso Chihuahua on top. is melted and brown in spots, about 15 minutes. Garnish with crema Mexicana, onion slices, and cilantro leaves. Note: These enchiladas are intended to be flavorful but not spicy hot, so use chiles accordingly. I used purchased tortillas (we have some good ones out here) but there's a recipe for homemade tortillas in the book, and the authors created an awesome video as well. Check it out! For more information, check out the book's website, Pinterest, and Facebook. 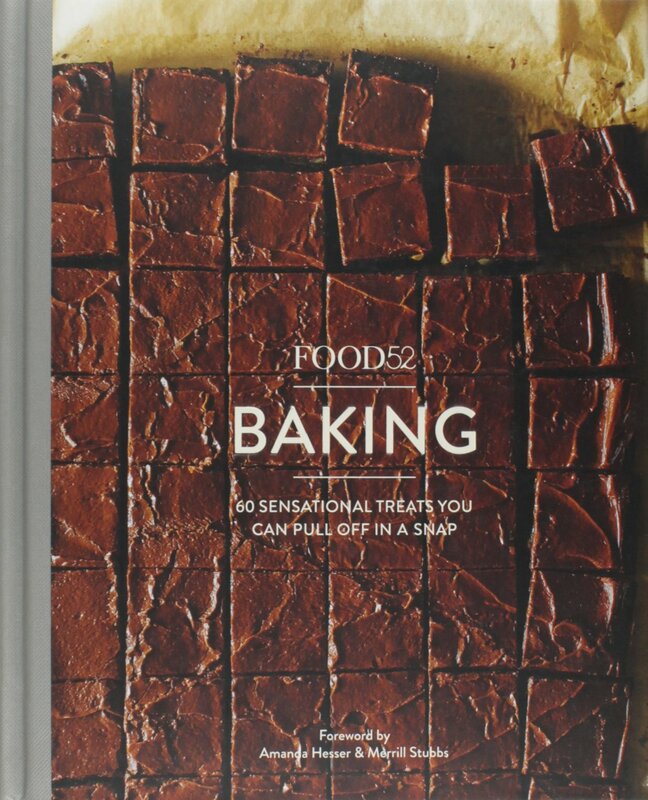 So, I was wandering through the new Food52 Baking book, and I was very tempted by the Chocolate Dump-It Cake. I'm not entirely sure what the "dump-it" refers to, since this isn't a dump-and-stir sort of thing. Ingredients need to be heated, although the mixing is done in a saucepan. But a second bowl is used for mixing the dry ingredients before adding them to the wet. The cake was supposed to bake in a 9-inch tube pan. I thought that might be a bit more cake than I wanted to have around. I mean, even with friendly neighbors to help me, there's only so much cake I can eat. So I decided to cut the recipe in half. Fortunately, it was easy to do without a whole lot of math or egg-dividing. Then I made one more little teeny change. I substituted Smirnoff Candy Cane Vodka for some of the water. And I baked it in a snowflake pan. 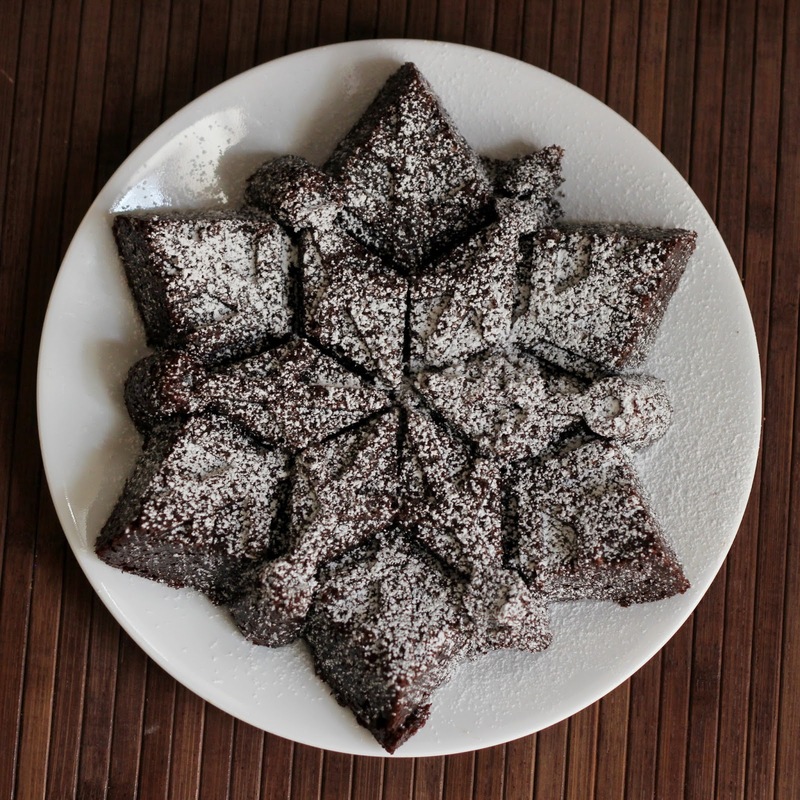 Yes, baking a chocolate cake in a snowflake pan might not have been the best idea as far as color is concerned, but I sprinkled it with powdered sugar and it was really pretty. The cake itself was pretty sticky - the instructions say to flip the cake onto waxed paper, but I flipped in onto a rack. It came out of the cake pan nicely, but got a bit stuck to the cake rack. Not a big deal. The stuck parts made a nice preview snack. The vodka added a nice peppermint flavor to the cake, but it wasn't overly strong. Chocolate was first, then mint. And the cake was really moist. I'd definitely make this again. And again. And again. Heat the oven to 375 degrees and spray a 5-cup baking pan with baking spray. If you only have larger pans, you could divide the batter or make a few cupcakes, but the 5-cup snowflake pan was just about the perfect size for the cake. Combine the sugar, chocolate, butter, and water in a saucepan over medium heat. Cook, stirring once in a while, until the chocolate and butter melt. Take the pan off the heat and let it cool slightly. In a small bowl combine the flour, baking soda, and baking powder. Combine the milk and vinegar (you can just add the vinegar to the milk in its measuring cup). Whisk in the milk mixture, then the egg. Whisk in the flour a little at a time, just until smooth. Whisk in the vanilla, just to mix it in. Pour the batter into the prepared pan and bake at 375 degrees until a toothpick inserted in the center of the cake comes out clean, about 25 minutes. Let the cake cool in the pan for 10 minutes. Place a sheet of wax paper on top of the cake and turn it out onto a wire rack with the wax paper under it. Let it cool completely. Hey, how about some bread? These aren't super-sweet, or I guess it depends on the type of dried cherries you use - sweet or tart. These buns are nice with butter or a little cream cheese for breakfast or brunch, but they'd also be nice as a dinner roll with pork or with something spicy, like chili. Of course, if you don't like cherries or you don't happen to have them on hand, you could use any other dried fruit you like. By the way, you can buy oat flour, and if you have that you can use it. But it's more likely that I'll have rolled oats that I can grind than that I'd have oat flour stashed away. Spray 12-cup muffin pan with baking spray - it’s not completely necessary, but I like the added insurance. Put the oats in a blender or food processor and blend until you have a powder. Add the cherries and pulse until they’re roughly chopped. You could certainly chop the cherries by hand, but since the machine is already dirty, you might as well use it, right? Combine all ingredients in the bowl of a stand mixer fitted with the dough hook. Mix slowly until mostly combined, then increase the speed and knead until the dough is smooth and elastic. The cherries will make the dough bumpy, but the dough itself should be smooth. You can also mix in a standard mixing bowl and knead by hand. Cover the bowl and set aside in a warm place to rise until the dough is doubled in size, about an hour. Flour your work surface and turn out the dough. Divide into 12 roughly even pieces. Divide each piece into three smaller pieces so you have 36 small balls of dough. Place three balls in each of the muffin cups. Cover the pan and set aside to rise until doubled in size. You'll know the dough is ready to shove in the oven when you poke it gently with your finger and the indent remains, or it fills in slowly. When the buns are risen, bake at 350 degrees until nicely browned, 20-25 minutes. Remove the buns from the pan and let them cool on a rack. Sometimes I love a recipe that's complicated. It might be several hours of work, many ingredients, and maybe even a bunch of gadgets, tools, bowls and appliances. The feeling of accomplishment when it's done is satisfying. On the other hand, I also adore recipes that are easy and fun. I like the idea that I can make something quickly and it looks like I spent a lot of time on it. This recipe is definitely easy and fun and creative. 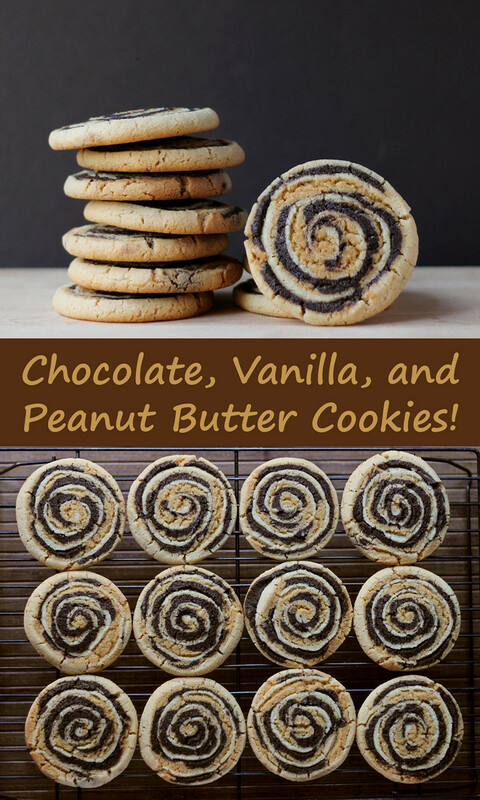 Made simple by the use of packaged cookie mix from Betty Crocker®, the result is still pretty darned impressive, with three colors in the swirl. And did I mention that it's pretty tasty, too? Yup. Tasty. These cookies help you spread the cheer with the simple surprise of a three-color swirl that's unexpected. To add even more holiday flair, you could roll the edges of the cookies in red and/or green sugar, but I'm sure you'll agree that they're pretty great without any flourishes. And then the fun started happening. Because it's always fun in my kitchen. Preheat the oven to 375 degrees and line several baking sheets with parchment paper if you will be baking immediately. After the two cookie mixes are prepared, remove about 1/3 of each dough and place that in a separate bowl along with the 2 tablespoons of cocoa powder. Mix well. Pat each dough to form a square and stack them on top of each other. Use a rolling pin to roll the combined layered dough to form a rectangle about 13x16 inches. It doesn't need to be precise - you can eyeball it. Starting at one of the long sides, roll up the dough jellyroll style, making a nice, tight roll. The roll should be about 2 inches in diameter, and evenly thick from end to end. If the roll is uneven or too thick, you can simply roll it on your work surface to even it out and squish and press it as needed. 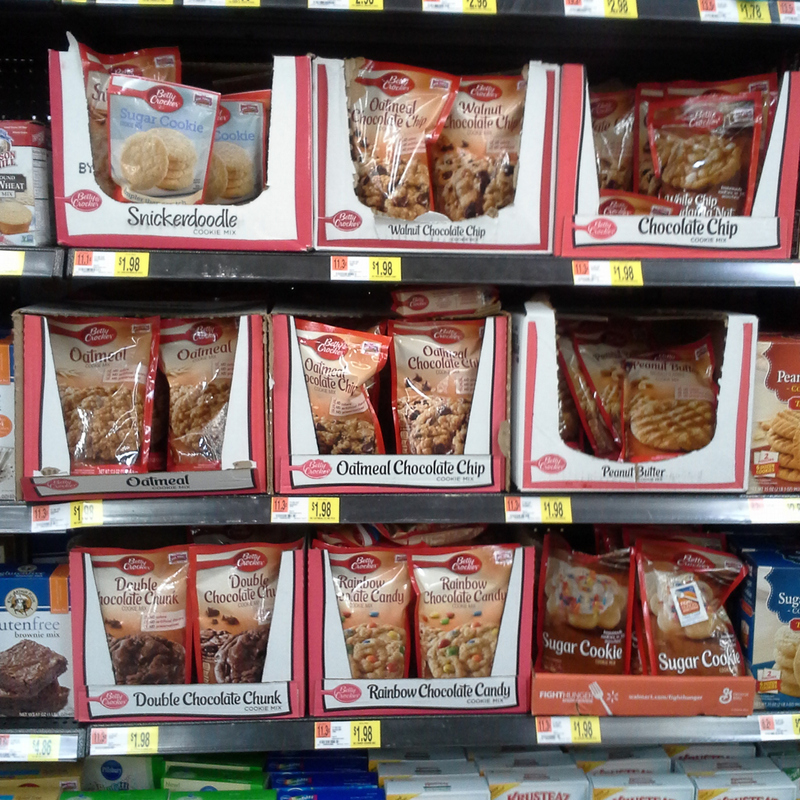 Part of the fun of these cookies is that they're not all the same, so you needn't take the rolling too seriously. Have fun with it. 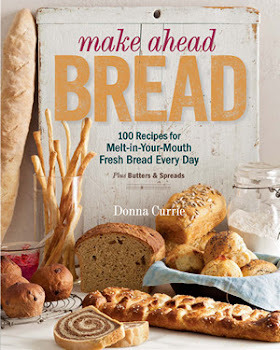 You can refrigerate some or all of the dough to bake later, if desired. 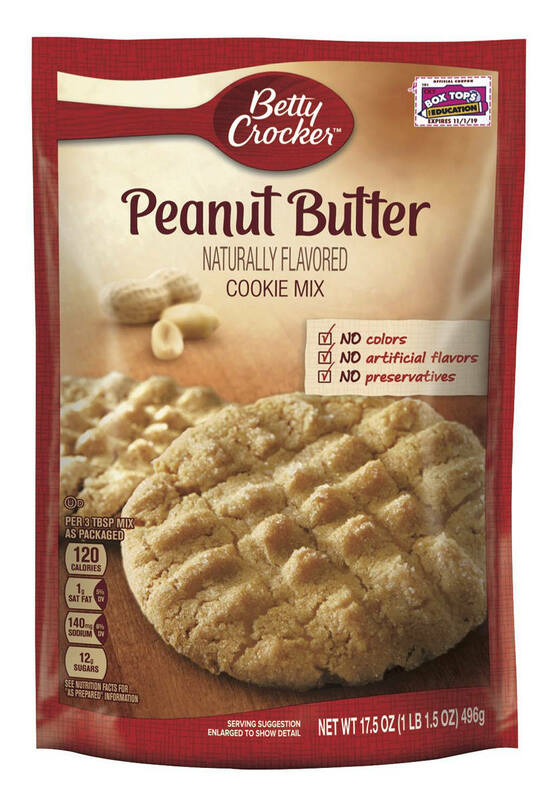 Just wrap it in plastic wrap until you're ready to make cookies. Otherwise, cut the roll into pieces about 1/2 inch thick and place them on the prepared sheets, leaving space between them. They don't spread a lot, but they do spread a little. Bake the cookies at 375 degrees for about 12 minutes, or until the edges of the cookies are just beginning to brown, and the bottoms are slightly browned. If you choose to refrigerate before baking, the cookies will take about two minutes longer to bake. Let the cookies cool on a rack before storing. Don't they look fun? And everyone who ate them loved them. So ... what sort of creative things are you doing for the holidays? Hmmmm? Cookies, perhaps? 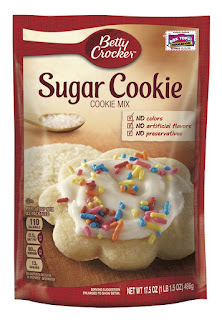 Want to make these cookies and save a little money? You can get a coupon here. This is a sponsored conversation written by me on behalf of Betty Crocker. The opinions and text are all mine. Okay, I admit it. When I was a kid, Vincent Price creeped me out. Or. more accurately, the parts he played were creepy. Little did I know that he was a foodie. Before there were such things as foodies. In fact, he came from a family of foodies. One would imagine that a star with the stature of Vincent Price would have spent a whole lot of time in fancy restaurants. But, like today's fans of food, he liked to cook. 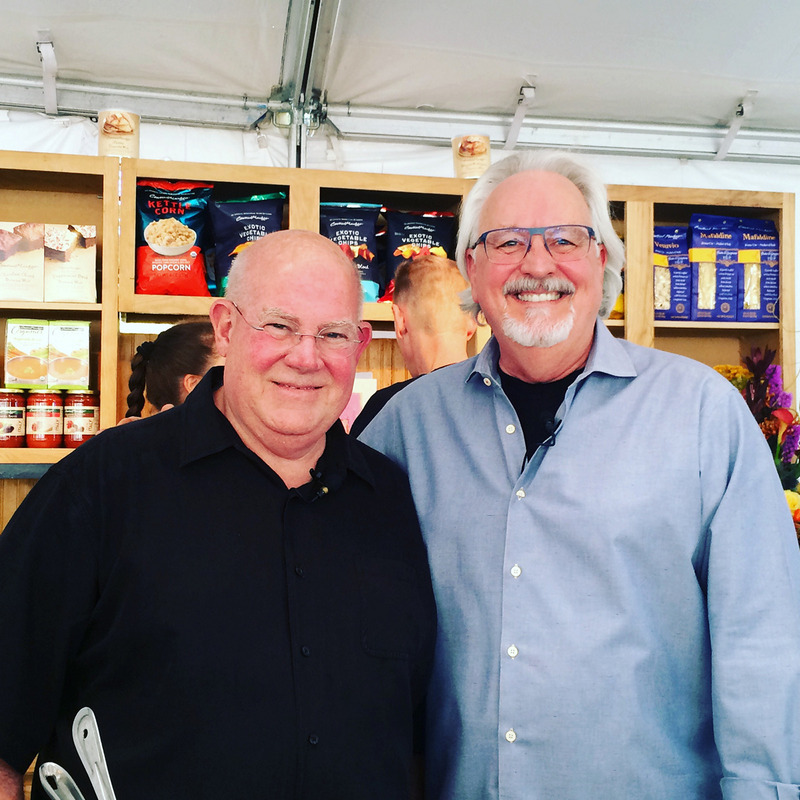 And even more important, he thought that good food should be available to the masses. 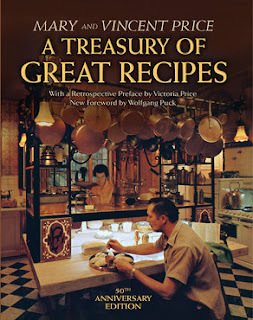 A Treasury of Great Recipes by Vincent Price and his wife, Mary, is a collection of recipes that the average cook of the day (the book was first published in 1965) could manage to make. But the recipes are inspired by restaurants. The book had been out of print for quite some time - and became crazy expensive as a collector's edition. But it has since been re-released by Vincent and Mary's daughter, Victoria Price, so it's more affordable, for sure. As I was browsing through the book, I spotted a recipe for "little thin orange pancakes" that seemed like a perfect fit (hehe) for a new pan I was testing. The pan is called a Plett Pan , and it has shallow indentations that are meant for making ... well, small pancakes. The Plett pan is usually used for Swedish pancakes, but after I looked at a bunch of recipes, I realized that the common theme was that the pancakes used about a tablespoon of batter each - just like the little thin orange pancakes in Vincent Price's book. And I thought, well, how about that? I could test a cookbook recipe at the same time I was testing the pan. (The pan will appear on the review blog later. For now, we're making PANCAKES. To be fair, Vincent Price's recipe didn't require using a special pan. But, hey, I figured the little pancakes would be cuter if I didn't free-form them. Combine the zest, orange juice. diced orange, and pancake mix in a bowl. Heat the pan. You can brush a little melted butter in the indentations, if you like but the pan I used was very nonstick and really didn't need it. I did add butter at first, but didn't add any more as I continued making pancakes. Put about 1 tablespoon of batter in each indentation. From this point, you're cooking just like you'd cook a normal pancake. Cook until you see bubbles coming to the top of the batter and the bottom side is golden or medium brown (depending on how you like them), then flip the pancakes and continue cooking on the second side until the pancakes are cooked through. I suggest using a small silicone turner to get under the pancakes to check the bottom and to turn them. To remove the pancakes from the pan, you can just flip the pan over, or slide them out, or remove them one at a time with the little spatula you used to flip them. These pancakes were sweet enough that they didn't need any syrup, but a little butter was nice. Sour cream would be nice, too, if you prefer creamy-tartness. I bought the cookbook; the Plett pan was sent for the purpose of a review (which will be on Cookistry Reviews a little later - right now I'm in the midst of GIFT GUIDES! How about a little Friday cocktail to get the weekend rolling? This time around, my friends at Smirnoff sent me a festive striped bottle of peppermint vodka to slurp up. Er, I mean to have fun with in the kitchen. It's a little sweet, but not syrupy-sweet, which I liked. Oh, and the bottle is scratch-n-sniff. Heh. I love the scent of peppermint, so that totally amused me. The first thing I thought of was an adult hot chocolate with mint, but for some reason I kept thinking that it would be even more fun as cold cocktail. Not icy, but ... well, adult chocolate milk. Yes, sometimes I'm just a big kid. And adding vodka to the glass gave me an excuse to have a glass of chocolate milk while I was watching television. Oh, and this stuff goes GREAT with cookies. You know, in case you want to leave some for Santa. The perfect garnish for this is a candy cane, if you happen to have some on hand. No matter what chocolate syrup I use, there's always some chocolate that settles to the bottom of the glass, and a candy cane is perfect for stirring. Unfortunately, the candy canes I had were a little too tall for the reindeer glass. But ... I had to have the reindeer glass for the photos! You could, if you wanted to, add ice cubes to this, or let it freeze then blend it up to make a slushie cocktail. Or, warm it for that hot chocolate cocktail. The vanilla extract is optional here, but I like the warm undertone the vanilla gives to the drink, while the peppermint has a more cooling effect. Isn't that reindeer mug cute? Combine the chocolate syrup and milk in a glass, adding the chocolate to taste. Seriously, make it like you're making chocolate milk - and the milk amount - yeah, add enough to fill the glass you choose, with enough room for the vodka. I'm so precise, right? Stir to combine chocolate with syrup ... add more chocolate if you like. Mmmm. Add the Smirnoff Peppermint Twist vodka and the vanilla extract and give it another little stir. Garnish with a candy cane, if desired. Thanks to my friends at Smirnoff (and related companies) for supplying me with cocktail ingredients all year long! Cheers! If you have that person in your life who doesn't care for sweet desserts, this cookie is for them. It's as though cornbread and a cookie had a transporter accident, and this is what happened. 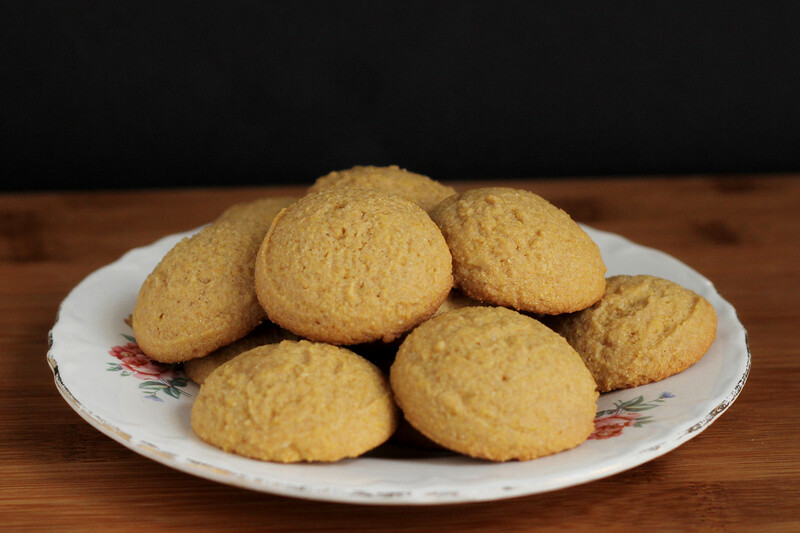 Take a bite of a cookie and you taste a little bit of sweetness from the honey, but then at the end the cornmeal flavor takes over. It's a complex cookie with simple ingredients. These would be lovely with some tea. For people who like sweet desserts, offer them some jam or an extra drizzle of honey. If you like, you could flatten the cookies instead of leaving them as mounds, and make sandwich cookies with the jam in the middle. Heat the oven to 350 degrees. Cream together the butter and the sugar and honey until light and fluffy. Add the vanilla and egg and beat until well blended. Combine the flour, cornmeal, baking powder, and salt in a bowl. Add the dry ingredients to the butter and sugar mixture and beat until well blended. Use a small scoop to portion the dough onto the prepared cookie sheets. Bake at 350 degrees for about 13 minutes, until lightly browned. Transfer the cookies to a rack to finish cooling. I've been fiddling around with a Santa-head shaped bread for quite a while. I like sculpted loaves. They're fun to make, and part of the fun is how oddly unpredictable they can be. For example, the bunny bread I made involved a lot of different versions before the bunny looked like a bunny and not a gargoyle. 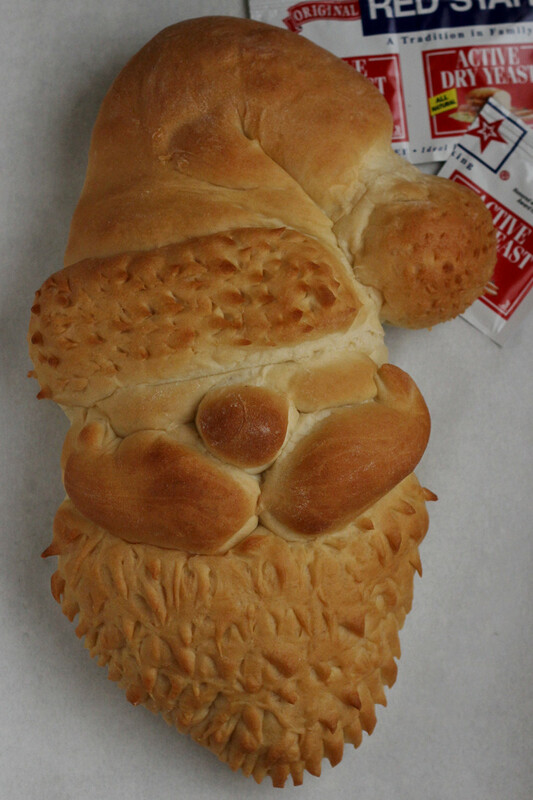 Santa-head-bread is a totally different story. I've made it a number of times, but I've never had an instance when Santa looked like Satan. He always always always looked like a jolly bearded elf. Sometimes he was a little fatter. Other times he was a little less puffy. Sometimes his nose was bigger or his beard was smaller. And over time, I've messed around with the details a lot. Different beard decorations, flour dusting, egg washing. And they all looked good. This time, I opted for minimal embellishment, with just some scissors snips to add texture to his beard and the furry band and ball on his hat. Of course, Santa was made using my favorite yeast from Red Star, the active dry yeast. Red Star Yeast sponsored this post, but it really is the brand I always use. I buy active dry yeast in 2-pound bags and keep most of it in my freezer and a small jar in my refrigerator where it's ready to be used. And yes, I use enough of it that it makes sense for me to buy that much! If that seems like a lot of yeast, keep in mind that I also sometimes use instant yeast, Platinum yeast, or my home-grown sourdough. Yeah, it's pretty yeasty around here. If you have your own favorite dough, you can use that to make Santa, but it should be a dough that behaves itself. It should be firm enough so that it doesn't slouch and spread, and it should be tame enough so it doesn't rise too quickly and ruin the design you create. You want it to rise, of course. But you don't want it to rise out of control or you might find Santa's nose rolling down his beard. Combine all of the ingredients in the bowl of your stand mixer fitted with the dough hook. Mix slowly until the dough comes together, then increase the speed and continue kneading until the dough is smooth and elastic. Cover the bowl and set aside until doubled in size, about 1 hour. Heat the oven to 350 degrees and line a baking sheet with parchment paper. Flour your work surface and turn out the dough. Divide it into 4 roughly equal pieces. Grab one piece and cut off enough to make a 1-inch ball of dough for Santa's nose. Form the larger portion into a flat oval about 4 1/2 inches wide by 6 inches long. You can just eyeball it, or even make it a circle. Place the large oval in the center of the baking sheet and position the nose in the center of the oval. Take the second piece of dough and form it into a long triangle to create the hat. The base should be as wide as Santa's face, and it should be long enough to fold the tip over jauntily. Place the hat on Santa's face, just above the nose. This Santa is a little sleepy and the hat covers his eyes. Take the third piece and form a beard for Santa and add it to the face you've been building. Take the last piece and divide it into three roughly equal pieces. Form the first piece into a flat band as wide as Santa's head this will be the furry hat band. Place it on the bottom of the hat and just above Santa's nose. Take the second piece and form it into your preferred moustache shape and place it right below Santa's nose. Adjust it so it looks the way you like it. Take the third piece and form a ball and add it to the end of Santa's hat. Cover dough and set aside to rise for 30 minutes. Tip: Use another sheet pan of the same size as a "cover" for the pan holding the dough. Meanwhile, heat the oven to 350 degrees. When the dough has risen for 30 minutes, uncover it. If needed, adjust the nose, hat band, moustache as desired. Take a small, sharp pair of scissors and make snips in the dough of the hatband and hat ball to create texture. The more perpendicular to the surface the scissors are as you snip, the shorter the spikes of dough will be. I made very small spikes on the ball and slightly longer spikes on the band. A similar technique is used on the beard. But first, I made some snips all the way through the dough around the edges. Then I held the scissors nearly parallel to the dough to make long, thin beard strands. If you like, you can brush parts of the dough with egg wash to make them shiny, or you can dust parts of the dough with flour. When you're done decorating, bake Santa at 350 degrees for 25-35 minutes, until the dough is nicely browned. Remove the pan from the oven, slide Santa, still on the parchment, onto a rack to cool. When it's cool enough to handle, remove the bread from the parchment and allow it to cool completely. And, no, it's not too cute to eat. Get out a knife and slice it up! Thanks to Red Star Yeast for sponsoring this post and particularly for being so willing to answer my questions about yeast! For more yeasty information, you can follow Red Star on social media: Instagram, Facebook, Pinterest, Twitter, and Google Plus.